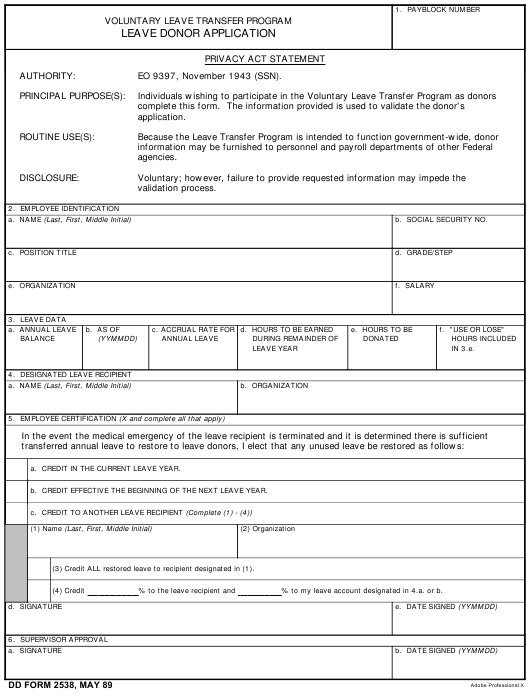 DD Form 2538 - also known as the "Leave Donor Application - Voluntary Leave Transfer Program" - is a Military form issued and used by the United States Department of Defense. The form - often incorrectly referred to as the DA form 2538 - was last revised on May 1, 1989. Download an up-to-date fillable DD Form 2538 down below in PDF-format or find it on the Department of Defense documentation website. EO 9397, November 1943 (SSN). a. CREDIT IN THE CURRENT LEAVE YEAR. b. CREDIT EFFECTIVE THE BEGINNING OF THE NEXT LEAVE YEAR. (3) Credit ALL restored leave to recipient designated in (1). % to my leave account designated in 4.a. or b.